So many people shy away from making their own pastry and I honestly have no idea why - my mum taught me how to make pastry when I was probably about eight or nine, and it is so quick and easy! This is a simple recipe, quick to whip up; you can throw the pie together in about twenty-five minutes, including making the pastry! 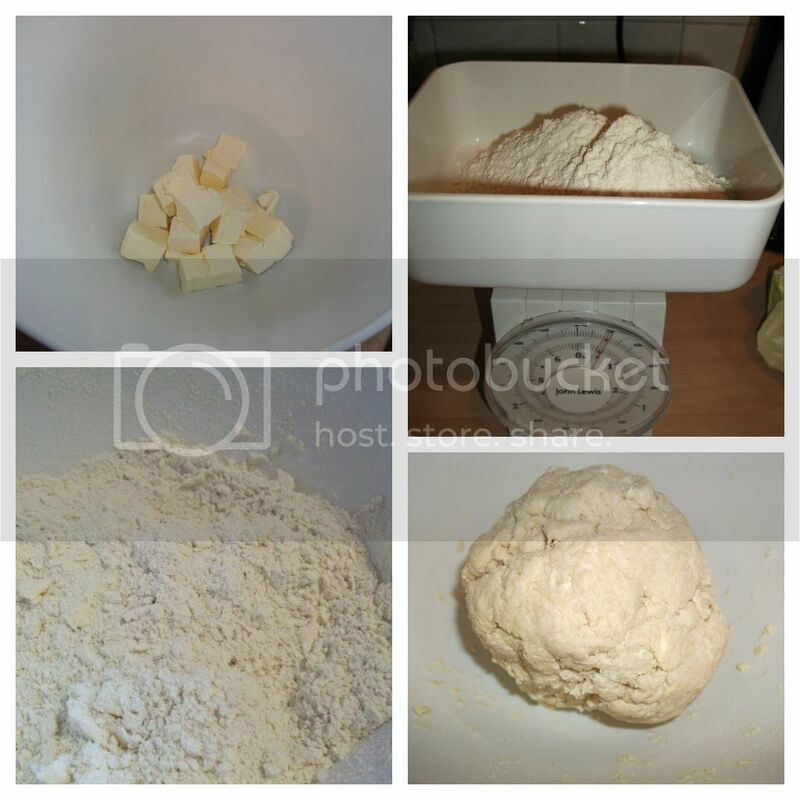 Melt 30g butter in a medium saucepan, then add 30g plain flour. Mix together to form a yellowish dough, then gradually add 300ml milk, stirring between additions to prevent the sauce from going lump (I provided more detailed instructions for making a white sauce in my Lasagne recipe, if you're unsure). Once you've added all the milk, season to taste with black pepper and simmer gently, stirring, until thickened - about five minutes. Meanwhile, boil seven or eight broccoli florets for about five minutes, and drain. Open and drain a small tin of salmon (you could use fresh salmon fillets, but they're far more expensive and would double the time taken to prepare the pie!) Once the sauce is thickened, stir in the cooked broccoli and salmon. Sprinkle flour over a clean work surface and a rolling pin, then roll out just over half your pastry to about 4mm in thickness. Drape over a 5" pie dish and gently lift and press down so that it fits into the dish. Use a sharp knife to trim the excess off the edges. Spoon your filling into the pie dish and smooth down with the back of the spoon as best you can - it's never going to be a perfectly smooth crust, you've got broccoli in it! Use a pastry brush (or your fingers) to rub some of the beaten egg round the rim of the pie. Re-flour your work surface if necessary and roll out your remaining flour to the same thickness. 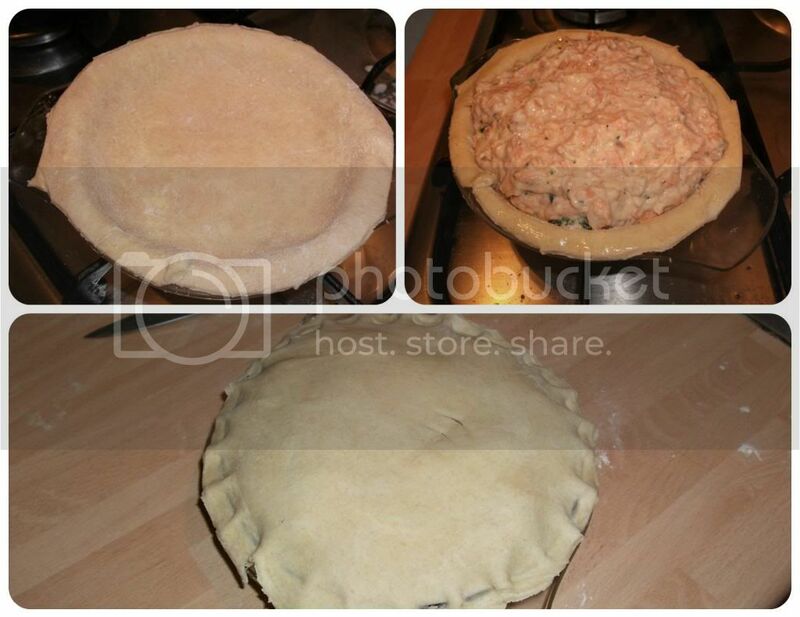 Fold in half and make a couple of slits with the knife so that the pie can let off steam. Drape the pastry over the top of the pie, trim with the knife, and use the back of a fork, or your fingers, to press the two pieces of pastry together to make a pretty fluted edge. Brush the last of the beaten egg over the top to form a glaze, and you're done! Now you just need to pop on a baking sheet and bake in a preheated oven at 180°C for 30-35 minutes, until the pastry is golden-brown and shiny. I serve mine with boiled potatoes and peas; you could do chips instead, or double veg if you fancy! Have you ever made pastry? Do you think you'll give it a try now? Go on, it's not hard, I promise! !